Thyroxyl is a synthetic thyroid hormone, triiodothyronine isomer. Mode of action – complementary deficiency of thyroid hormones. Increases tissue oxygen demand, stimulates the growth and differentiation of tissues, increases the basal metabolic rate (proteins, fats and carbohydrates). In small doses has anabolic and large – catabolic effect. It inhibits the production of thyroid stimulating hormone. After ingestion it is absorbed 95% for 4 hours. The latent period is 4-8 hours. The blood is closely associated to proteins. The maximum pharmacological effect occurs within 2-3 days. T1/2 – 2.5 days. 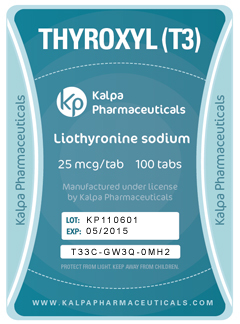 Thyroxyl recommended dosage is 25 – 100 mcg/day. Headache, irritability, tachycardia, arrhythmia, angina, heart failure progression, dysmenorrhea, allergic reactions.